Transformers: From left, Tapuwe Mataruka, Munashe Gomwe, Dalisu Jwara, Leroy Nyarhi and Munya Tshuma, founders of AmaDODA, hope to transform South Africa and Africa by being the positive male role models they want to see in society. Their vision is clear. Their purpose defined. They want to inspire a generation to become men of value – positive male role models that will lead and transform society. “You can’t just live for yourself. It’s not enough to grow up and just take care of your family. There are people out there who need, and you need to go out there and help them,” says Munya Tshuma, the UCT student who, together with four friends, founded AmaDODA. The AmaDODA founders (Tshuma, Leroy Nyarhi, Dalisu Jwara, Tapuwe Mataruka and Munashe Gomwe – all commerce students) hope their movement will awaken ambition in African men through leadership and Ubuntu, among other values. The decision to establish this vehicle for social change came after a chance encounter with a beggar in Johannesburg. Nyarhi and Jwara were approached by the woman, who told them of her abusive husband and hard life. She made them promise that they would be good men, and stewards of society. 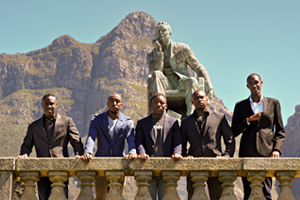 They were inspired to address the dearth of good male role models in South Africa, by being the ideal they hope to see realised, both in South Africa and on the rest of the continent. All five founders of AmaDODA are student leaders. “Because we’re leaders, we understand that from a national perspective, the quality of life that people enjoy is a function of the decisions made by the country’s leaders. If you have leaders whose hearts are not with the people, they will never be able to serve the community [and move] towards success,” states Nyarhi. “AmaDODA is not a backlash to feminism,” asserts Mataruka. “There are many platforms for women to engage and talk about the issues affecting them. For men there are no such platforms; which presupposes that we have everything together, when we do not,” adds Gomwe. AmaDODA seeks to provide a platform where male issues can be aired. “We also hope to present a platform for South Africans as well as Africans (men and women) to define a man of value in this generation,” explains Nyarhi. The movement’s first foray into providing a platform for African men has come in the form of a campaign on Facebook, titled ‘Why I have to be successful’. Participants send in a photo of themselves plus a summary of their aspirations and dreams, which is then posted on AmaDODA’s Facebook page. Both males and females have participated in this campaign. According to Jwara, AmaDODA have plans to speak at high schools, in prisons and at conferences to get their message across. But their movement is still in its infancy, and they are currently connecting with various like-minded organisations to expand their network. He commended the founders of AmaDODA for grappling with the challenges men are faced with today, and breaking the silence around male issues.